Two of my favourite fashion editors had a recent chat about London Fashion Week, McQueen and the coveted style of Covent Garden. CG is one of my fave places on Earth, discovered on my first visit to the city many years ago. I never miss it on a return trip to Londontown. Here’s Ah-na, interviewed by Hil’ry for Telegraph TV. There’s a Twitter rumour making the social media scene, about Hilary retiring. I’ll believe it when I read the story from the Fashion Director of the Daily Telegraph, herself. And we haven’t heard a tweet from her directly, have we? As #8 on the UK’s Twitter elite list, I can’t imagine my daily fashion feed without her – or the front row sans that sunburst, bike-spoke necklace or that fur topper. 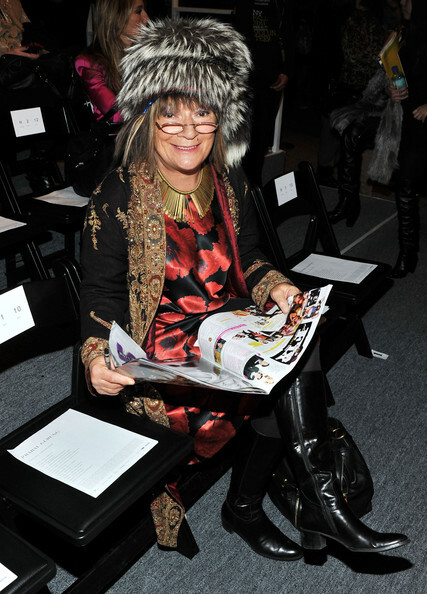 Ms. Alexander in her trademark accessories and an Indian embroidered coat.